NOTE: For each detail picture, click on the image once, then again, for a full close-up. … because where the leaves previously connected to the aloe tree’s trunk, was a perfectly circular collar. The collar-like effect was further reinforced by what looked like fine stitchery — complete with threads and needle holes — still intact. Color-wise, these collars are reminiscent of vintage celluloid collars, or ivory artifacts, from the late 1900s … the entire effect is an arid prettiness at collar end, with a darker, rougher-textured striation, opposite. Really fanciful, and somehow both seemingly manmade and natural at once. Now, in full contemplation mode, I decide to take a closer look while tidying up around the garden. 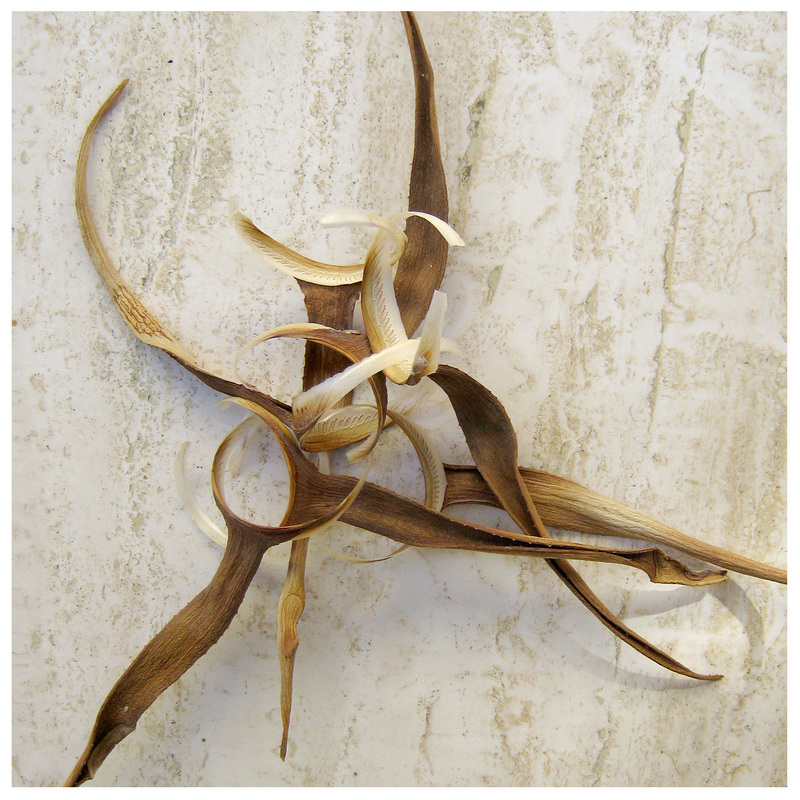 Producing a charming rattle, these acacia pods are full of tiny almost-black seeds. 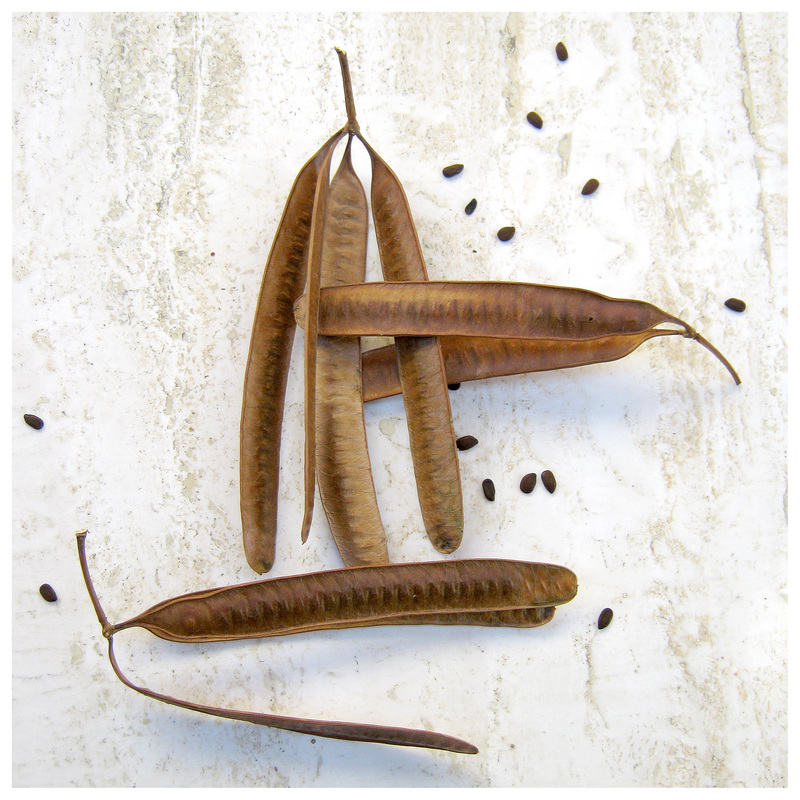 Close to 10-inches-long, these pods are nut brown, with a dry, tanned-leather look and texture. The tree these came from is loaded with these gracefully hanging pods, and they look like dark fingers waving quietly in the afternoon breezes. Again, taking a look at these plant structures close up is strangely rewarding. Like a delicate, fine silk scarf that’s been washed and allowed to dry crumpled, these brittle echeveria leaves are singularly gorgeous. 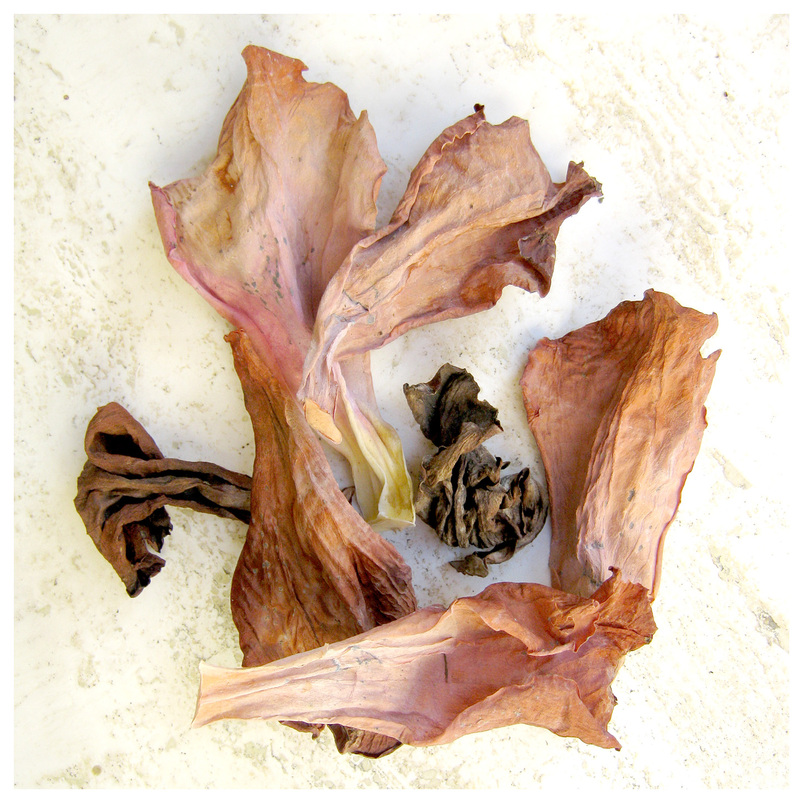 What once was a deep maroon, has become a rich tobacco brown, and formerly reddish purple leaves have taken on a faded rose-pink hue. Clicking twice for the closest look, it’s easy to see small spots of gray, and traces of yellow, adding subtle accent to a haute couture color palette. The grand finale: another echeveria, this time a fallen stump, displays a panoply of stunning textures. Decay is beautiful here, and the range of colors to be found among the leaves includes a startling persimmon orange, various cool greens and a number of shades of black-purple. Additionally, the bubbly, knobby surfaces, the crimped, ruffled edges and the swirling shapes of the leaves are strangely — bizarrely — lovely. 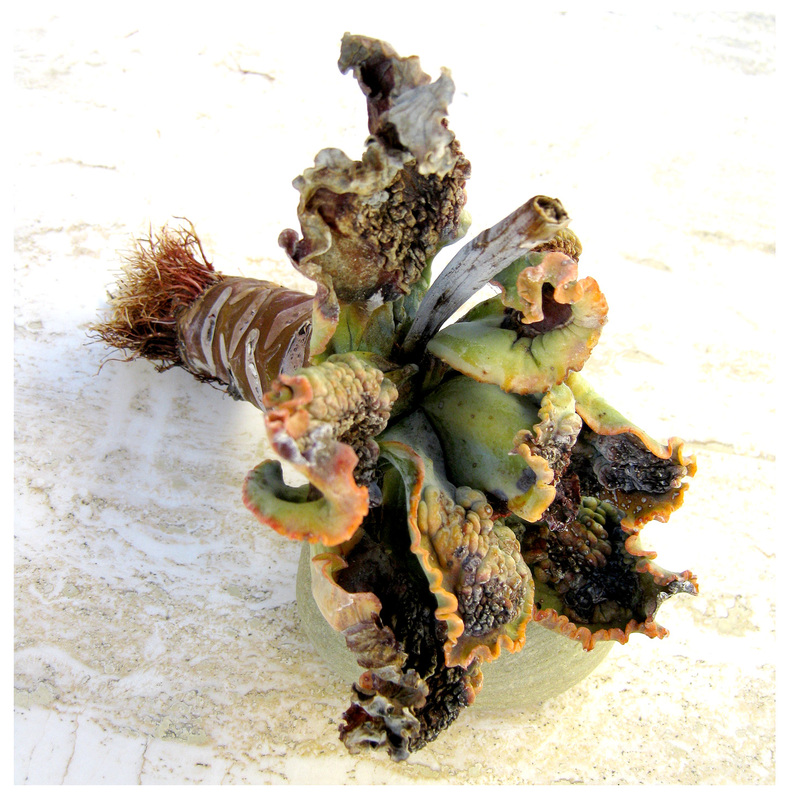 Still more rich texture and color presents itself on the scarred stem, which ends in a shaving-brush of root fibers. Only about 4-inches in length, I can’t believe I almost pitched this echeveria fragment as trash. 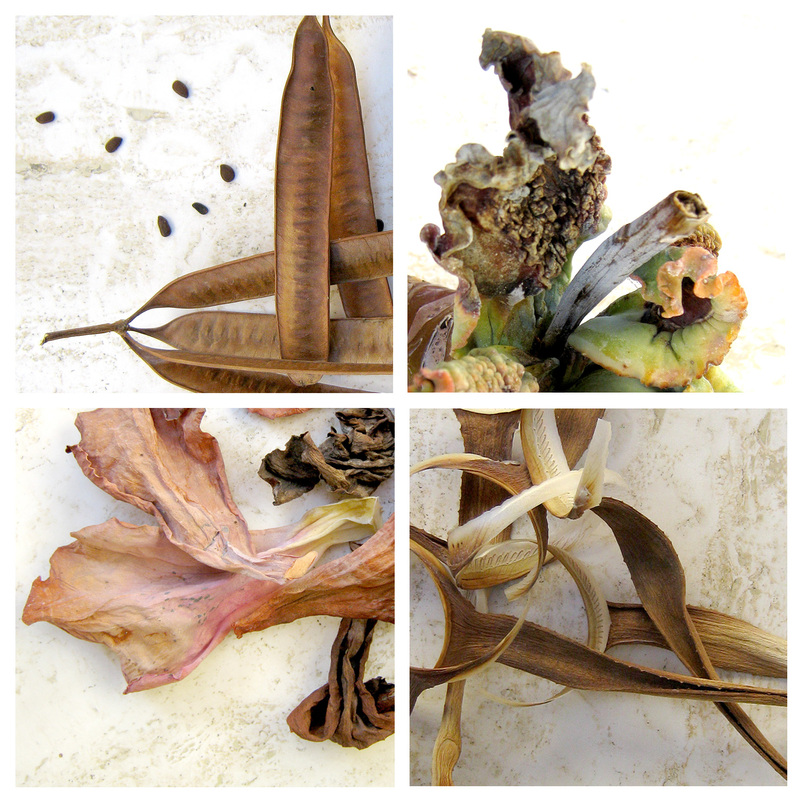 Examining and photographing these fallen fragments has taken some time away from my gardening clean-up time, but it’s been worth it. Heightened visual awareness is always a good thing, I think, and I’m reminded of the obvious: the garden presents innumerable opportunities for amazement. I just need to find a way to strike that balance between my limited gardening time and taking the time to look — and see. This was a beautiful post…the photographs and the words. Thank you for taking more time out of your garden clean up to share what you saw when you stopped and looked. It’s poetry. How lovely is your description of the Echeveria leaves – “Like a delicate, fine silk scarf that’s been washed and allowed to dry crumpled” – that is so evocative. I’ll accomplish nothing today as I see the garden with new eyes! One of the hazards of looking … thanks for commenting!